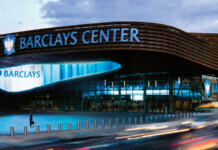 Heading to New York Yankees Stadium is one of my all time favorite things to do in NYC! 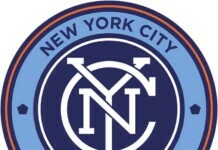 Yankee Stadium is home of the NY Yankees and the brand new in 2015 NYC FC (Football Club – Major League Soccer). The Yankees had just finished their incredible FOUR GAME SWEEP AGAINST BOSTON, some games going later than 1:30 am, so the crowd was on a high at this Monday night game in August vs. Toronto Blue Jays. 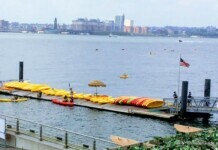 Getting to New York Yankee Stadium could not be eaiser – or more fun! The 4 train is packed with fans covered head-to-toe in Yankee gear. Weeknight games, the subway is crowded, as daily commuters are heading home from work. 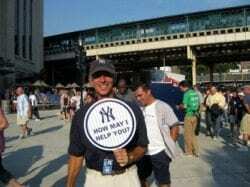 You’ll always know when to get off the subway – just follow the other 50,000 fans to New York Yankee Stadium! 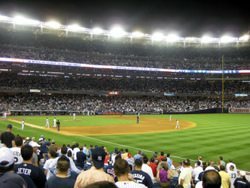 More on New York Yankee Tickets and Schedule. 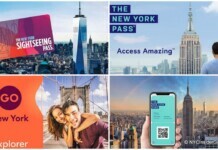 Fill up your Metrocard, if it’s not Unlimited Ride, before you go to Yankee Stadium, or you’ll be waiting for hours trying to fill it at the subway station after the game. The new Yankee Stadium (opened in 2009) is beautiful. The outside of the entire Stadium is covered with huge signs spotlighting every Yankees player. Everyone arrives at New York Yankees Stadium wearing Yankees clothing – everything from hats to socks. What other stadium in the world has dozens volunteers outside just waiting to see if you need anything? 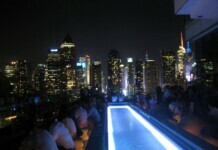 I keep hearing these rumors people don’t think New Yorkers are nice..go figure. Babe Ruth, Lou Gehrig, Joe DiMaggio, Mickey Mantle, Jackie Robinson, Bucky Dent, Reggie Jackson, Thurman Munson and so many more. 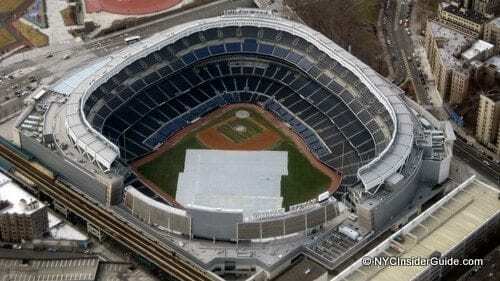 The original New York Yankees Stadium is, of course, nicknamed, “The House that Ruth Built” after the Babe. 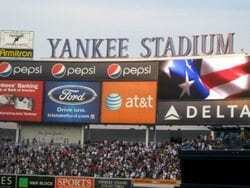 Mixed in with the Player pictures are huge flags with the NY Yankees Symbol. 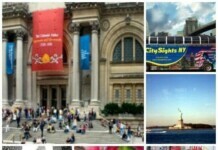 So much to do in addition to the game – tons of shops and restaurants of all kinds and the New York Yankees Museum. I headed straight to Tommy Bahamas Restaurant to get some wine. Of course, most other fans are drinking a cold one – Yankees Beer! 18th Row seats had waitress service and cup holders, very nice. Clean, spacious and roomy. The lovely waitress took our orders, Hot Dogs – with mustard and onions, of course. The stadium has lots of healthy choices, but family tradition won that day. If only there were air-conditioning! I guess it would be hard to cool off 52,325 seats. Check the Yankee Stadium Seating Chart. Hung out for a bit at New York Yankees Stadium watching the players warm up, sign a few autographs. 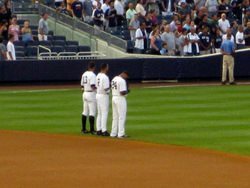 Alex Rodriguez (A-Rod), Derek Jeter and Robinson Cano, Yankees infielders, during the pre-game National Anthem. 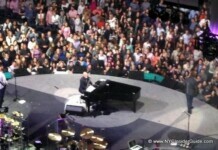 Jeter (retired in 2014) is the Yankees team captain – leadership, grace under pressure and despite all his fame and success, manages to maintain an appearance of humility. Is there anyone not wearing Blue and White? The crowd is standing room only while Jeter’s at bat… Seventh Inning Stretch is coming soon. 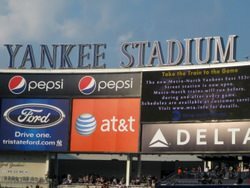 Freddy Sez Yankee Stadium – More than 85 years! Maybe you’ve heard something that sounds like pots clanging together in the background during a televised Yankee Game? Well, that’s exactly what it was. Freddy Schuman, aka “Freddy Sez” (1925 – 2010) carried a frying pan painted with a shamrock, which he said “Brings ’em luck.” Fans bang loudly on the pot with a spoon to make noise. The city sends special subways right to Yankee Stadium as soon as the game is over and my cousin and I were home in 20 minutes – before my parents even got out of the parking lot!